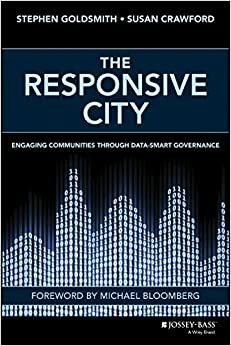 The book chronicles more than just technology’s potential; it also highlights what some local governments have already achieved with innovative approaches. After several fires resulted in the deaths of five people, New York City built a system to identify buildings at high fire risk, using predictive models and integrating data from multiple sources. City inspectors are now aggressively targeting those buildings for upgrades. To fight its rat problem, Chicago is using data analytics to predict where rats will gather, instead of waiting for resident complaints. Boston has developed a civic customer-relationship management system, with mobile-device apps, to link residents more easily with city services. Mimicking the way that Yelp collects restaurant reviews, Washington, D.C. uses a website to solicit ratings of city services. Cities around the country are adopting open-data portals. Goldsmith and Crawford are candid about the challenges facing their responsive-city vision. Progressive-era reforms designed to eliminate corruption also curtailed government employees’ discretion, leaving them with narrowly defined roles and limited ability to respond effectively to real-world problems. Rigid job descriptions, such as “temporary full-time permanent intermittent police officer,” are common in cities like New York, which has more than 2,000 such classifications. Procurement rules require that detailed specifications be prepared in advance, unlike in the private sector, where technology and other solutions are often developed iteratively. Government’s rigid contracting processes make it tough to respond to findings during development. I also sat down with Steve Goldsmith recently to talk about the book, and some of the challenges and pitfalls of this technology-drive approach. If the audio embed doesn’t display for you, click over to listen on Soundcloud.